During the build-up of power in Nazi Germany, the first breakthrough of de-coding German communications was achieved in Poland. In 1939, Polish code breakers shared their knowledge with British Intelligence, providing a valuable head start in the continuing struggle to keep ahead in the shifting game of counter intelligence. 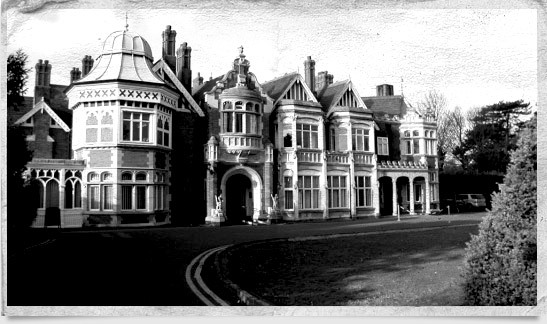 From these early beginnings, representatives of the Government Code & Cypher School under the guise of “Captain Ridley’s Shooting Party” discovered the Stately Manor House & Estate of Bletchley Park. Situated equidistantly between the leading University cities of Oxford and Cambridge, with rail and road links to London, this 50 acre site was perfect for the new and highly secret Intelligence Centre. The best mathematicians from Oxford & Cambridge were recruited to de-code and interpret the massive volume of secret German military signals. Linguists were brought in, and a crossword competition was organised by the Daily Telegraph to gather the most brilliant minds in the country. In these early days, the tiny radio signals room at Bletchley was identified as ‘Station X’, it being the tenth in a sequence of such bases; this name then stuck for the duration and became the coded identity for Bletchley Park site. Military communications in this new mechanised war of fast movement inevitably relied on radio technology as there was insufficient patience for laying land lines. Listening stations were established across the Country and manned mostly by women, including 1,600 Wrens. British radio engineering was the most advanced in the world and the Enemy was unaware of this highly developed technical skill. 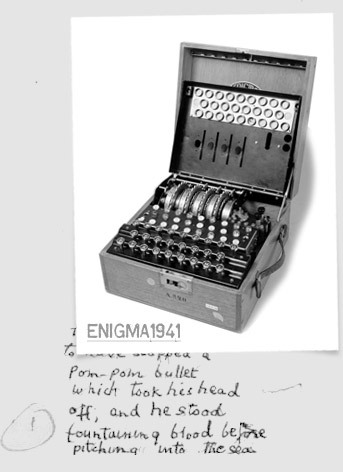 Breaking of ENIGMA coded messages was the critical demand during the early years of warfare. The Battle of the Atlantic was at first defensive – to stop the Nation from starvation. As time went on, maintaining that ocean link with the New World was essential to the build-up of resources in preparation for the Second Front. The code breakers at Bletchley received U-boat signals, deciphered and translated them, and passed the essential intelligence to London and the Royal Navy for execution. For some time Alan Turing was head of Hut 8, the section responsible for analysing and decoding German naval encryptions. Turing, an outstanding mathematician and cryptanalyst, was largely responsible for developing the ‘Bombe’ electromagnetic machinery from an earlier Polish idea. To overcome the extraordinary complication of the ENIGMA machine and its codes, mechanical assistance was provided by the ‘Bombes’. Mathematicians working under Turing were able to reduce probabilities by producing a ‘crib’ which could be fed into the Bombe to mechanically sift through likely solutions. To overcome the extraordinary complication of the German ENIGMA machine and its codes, mechanical assistance was provided by the ‘Bombes’. Working from a probable ‘crib’ the Bombe would run mechanical tests until it stopped at a possible solution. As radio traffic increased massively, so Station X had to increase its resources and facilities. The site spread out quickly from the Manor House with the building of wooden huts, then brick built blocks. Growth was sudden and exceeded any degree of normal capacity; local carpenters and even coffin makers were brought in to help with rapidly expanding building works. By 1942 it is believed the total compliment of staff at Station X was around 10,000, reaching in excess of 12,000 by 1945. This volume increase led to a knock-on demand for billeting and transport, along with all service requirements for such a busy site. All this had to be achieved without attracting attention; nothing of remark could be visible from the air and any suggestion of military activity needed to be covered. Similarly, the successful decoding of transmissions had to be carefully used so that the Enemy would not become aware of the loss of secrecy in his signals. Military commanders had so much information made available to them, it became difficult to judge which information was reliable and which was conjecture. Early success came in identifying German Luftwaffe tactics during the Battle of Britain in the Summer of 1940. The Royal Air Force fighters, spread so thinly in comparison to resources under command of the Enemy, were wisely used sparingly, always maintaining reserves even when the might of German Nazi forces was unleashed on London in the Blitz. Mindful of the importance of Intelligence, management of the population at home was vital. 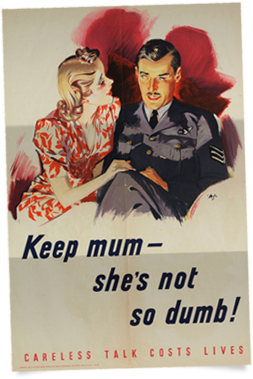 News media was carefully and strictly managed with memorable catch-phrases like “Careless Talk Costs Lives” and “Keep Mum, she’s not so Dumb”. In North Africa, ‘ULTRA’ information provided accurate information about the supply line to Rommel’s Afrika Corps. Ships carrying essential fuel, munitions and food were tracked by the code-breakers to the extent that individual ships and their cargoes could be identified. Munitions ships were sunk whilst ships carrying food & provisions could be allowed through. It was Station X which provided the essential and timely intelligence needed so that Montgomery was able to predict Rommel´s moves and act accordingly. As the war progressed, intelligence gathering had to move quickly with it. The Enigma process became too slow. It needed three men at each end of communications: one to operate the coding machine, one to take down the coded message and the third to transmit the message in morse code. Additionally, Hitler was known to be pressing for ever improving security in military communications. In due course the LORENZ machine was introduced, based on a teleprinting procedure. 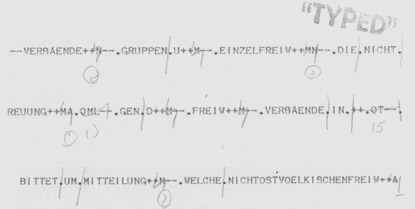 German use of ‘Lorenz’ increased. The teleprinted messages were referred to by Station X as “FISH” and their coded content as “TUNNY”. Although this was decrypted, the procedure was too slow for the message to be of military use. In a sense, breaking into the code was to identify and unlock number patterns. Initially this was achieved manually and in the lost laborious manner by the 24 year old code-breaker, Bill Tutte. To speed up the process, a machine was developed known comically as “Heath Robinson”. More mechanical than electronic, this machine took important steps in the right direction but necessity drove invention leading to a GPO Engineer, Tommy Flowers, designing and building the first semi-programmable computer. This became known as “Colossus”. Colossus 1 was the size of a living room and weighed about one ton. Its 2,400 valves replicated the pattern of an encrypted Lorenz message as electrical signals. This breakthrough in computing remained a secret for many years, to the extent that two Americans falsely took credit for inventing the computer in 1946. 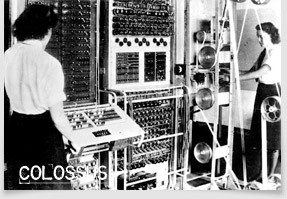 In their genius invention of Colossus, the Bletchley Park staff of mathematicians & technicians made a vital contribution to the successful progress of the war, and especially to the essential preparations for the D-Day Landings of June 1944. A thorough awareness of the German Armed Forces present in the Normandy area, ready to repel the invasion. Such information was hugely detailed, including quantities of troops, vehicles and tanks, as well as maintenance and serviceability information. A clear confirmation that the Enemy High Command had swallowed the deception structured in Operation Fortitude – that the Enemy’s belief was complete in an expected invasion in the Pas de Calais area… not Normandy. This apparent acceptance by the German Command that an attack would be made across the shortest Channel crossing confirmed to Bletchley that it was the Führer, Adolf Hitler, who was directing German military thinking. Knowing this disconnection from a proper military direction of the war helped the code-breakers at Bletchley read Hitler´s mind and predict the next moves. In preparation for D-Day the primary Intelligence effort was to convince the Enemy that the Landings would take place at a different time and a different place. All information and appearances had to be carefully and cleverly harmonised to present a believable picture of forces gathering in readiness for a Channel crossing from Dover to Calais. The planned misinformation included suggestion of an invasion of Norway, hopefully causing a diversion of enemy mechanised troops from Northern France and the Low Countries. 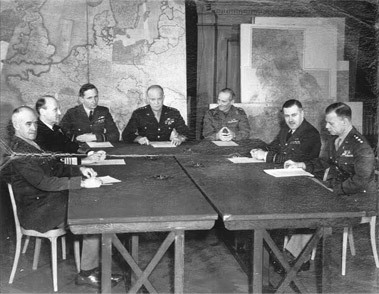 All means were employed to mislead the German High Command, using diplomatic sources, double agents and false information – all being co-ordinated at SHAEF Headquarters at Southwick House under the command of General Eisenhower. Named the 1st United States Army Group, a fake army of one million men was created, under General George Patton. This army was given encampments in Kent, with mocked up tanks made of plywood or inflated rubber, all created by a British Film Studio. Mock vehicles and associated military equipment were assembled so that aerial reconnaissance would be misled. Falsely constructed aeroplanes and gliders were laid out in the open in large quantities and high volume radio traffic was created in order to represent a busy divisional headquarters. By this point the Germans knew that invasion was likely. Their forces in France and the Low Countries were under the command of General Gerd Von Rundstedt's command, whilst Army Group B was under the command of Field Marshal Erwin Rommel, the ‘Desert Fox’. It was Rommel’s Seventh Army which held Normandy, with the Fifteenth responsible for the Pas de Calais, Belgium and the Netherlands. 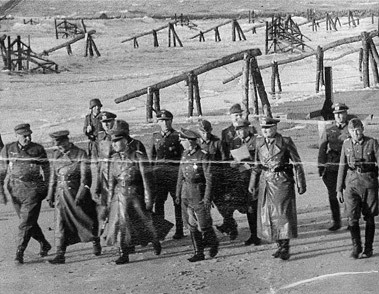 The Germans had been at work on defences of the Atlantic wall since 1942. When Rommel took over as Supreme Commander in the West in November 1943, he pushed the work ahead as quickly as he could, using half a million troops and forced labour of the Todt Organisation to strengthen defences. Intelligence gathering from French Resistance and aerial photography identified that beaches were strewn with steel and concrete wrecking devices, with coastal roads being heavily mined and barred by fortifications and tank traps. Every accessible landing place was enfiladed by fire of hidden batteries and machine gun emplacements. In case names became known through constant use during the planning stage, each of the landing beaches was given its own code name. Planners knew they must have accurate intelligence of beach conditions so midget submarines were used to gather sand samples from the selected landing beaches. Tests had to be carried out to ensure that sand structure could bear the weight of tanks and other heavy vehicles. Sophisticated internal communication links were formed with all Intelligence Departments so that the Enemy could not deduce patterns of concentration, giving away the likelihood of a landing area. The complexity of deceit in intelligence operations led to the construction of various ruses in support of OPERATION FORTITUDE. One such trick was the employment of M. E. Clifton James, a Lieutenant in the Royal Army Pay Corps. James was a small time professional actor and had an uncanny resemblance for Field Marshall Montgomery. Carefully directed by MI5, James modelled himself on Monty and openly toured Europe and North Africa. Made famous in the 1958 film “I was Monty’s Double”, this crafty exploit laid a false trail for German Intelligence, leading them to believe if Montgomery was away touring the Mediterranean region, then the invasion of Europe must be some time off. The final element in favour of the Allies was the inclement weather. This was not ‘intelligence’, but plain coincidence. As the date for D-Day approached, with all German thoughts on the Pas de Calais and believing Montgomery to be otherwise engaged on his tour, the weather turned bad. It was unthinkable that the Allies would attempt a massive troop movement across the English Channel in stormy weather. Shipping would be unmanageable and landing craft could not possibly function. Without a harbour in their control, the Allies would not dare land in early June, not against the massively defended Fortress Europe… would they?